Panasonic LUMIX G X VARIO 12-35mm / F2.8 ASPH. / POWER O.I.S. Introduction The Panasonic Lumix G X Vario 12-35mm f2.8 ASPH Power O.I.S is a high quality zoom lens with a Micro 4:3 mount. It will fit onto cameras from Panasonic and Olympus. The design is of 14 elements in 9 groups, 4 of the elements are aspherical, 1 is UED (Ultra Extra-low Dispersion) and 1 is UHR (Ultra High Refractive) Glass. 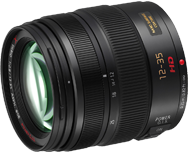 The lens features nano-surface coating to improve transmission and contrast.The Focal length range of 12mm to 35mm covers the “standard” range, the relative focal length for full frame 35mm would be 24mm through to 70mm.